Are you working with Nutanix APIs? Are you trying to figure out how to fully leverage the power of your Nutanix systems through automation and cloud-native technologies? Just curious to see what Nutanix APIs can do? Then Developer Day is for you! Hear from the actual developers of Nutanix software and APIs—and best of all, learn how to take advantage of our new cloud-native development products to launch your team to the hybrid cloud era. After lunch, our most innovative customers will share how Nutanix has made their developers’ lives better, and then we’ll get hands-on in a lab of your choice. Included as a bonus with Developer Day is Day 2 of .NEXT with amazing main keynotes, informative breakout sessions and the .NEXT expo hall. Run your code on Nutanix? 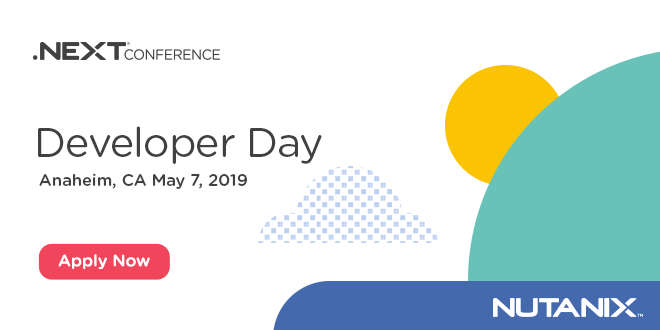 Don’t miss Developer Day!